For more information, see: landing craft. The Landing craft, mechanized, commonly known as the LCM or Mike boat, and sometimes as landing craft medium, was a landing craft widely used by Allied forces in World War II and thereafter; postwar versions of the LCM are still in occasional use today. 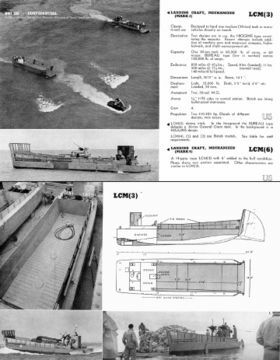 The LCM is used in amphibious warfare to transport tanks and other heavy equipment from the transport ships to the beach. It can also be used to transport troops, equipment, supplies, and virtually anything else that is smaller than a tank. The salient features of the LCM were its flat bottom; its bow ramp, which could be lowered to facilitate unloading when the boat grounded on the beach; and its large cargo capacity. In a typical WWII amphibious assault, waves of LCMs carried Sherman tanks to support troops that had already landed on the beach. Later waves brought other vehicles, equipment, and supplies, as well as follow-on troops. LCMs were brought to the assault zone on the decks of attack cargo ships or in the well decks of dock landing ships. The boats stored on deck were lowered into the water empty except for their crews; tanks and other cargo were lowered into the boats by cargo booms on the ship. There were several versions of the LCM, each version larger than its predecessor. The original version, LCM(3), was designed to land one medium tank, or 60,000 pounds of cargo, or 60 troops. Its successor, the LCM(6), had 6' added to the hull amidships; other characteristics were similar to LCM(3). A later version, LCM(8) was larger and completely redesigned.